In 2-quart saucepan, place apricots, 1 cup water and the sugar. Bring to a boil. Reduce heat; cook 15 minutes or until apricots are soft. Cool 15 minutes. In blender, place apricots and liquid. Cover; pulse until coarsely chopped. In large bowl, pour boiling water on gelatin; stir until gelatin is dissolved. Stir in apricot mixture. Let stand until cool, about 15 minutes. Carefully fold in the whipped topping. Spoon into 10 individual 10-oz dessert bowls or custard cups. Refrigerate at least 1 hour or until set. 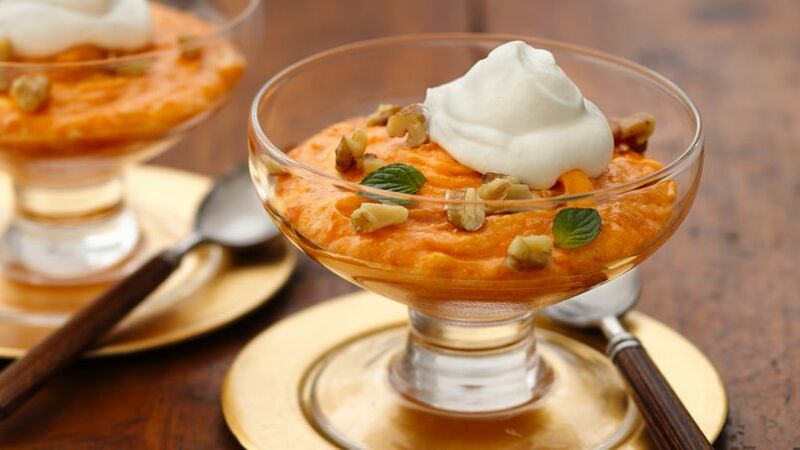 Top each serving with whipped cream, walnuts and mint. Better to use Mediterranean- style dried apricots if available, as they are sweeter. If desired use 2 cups of sweetened whipped cream.